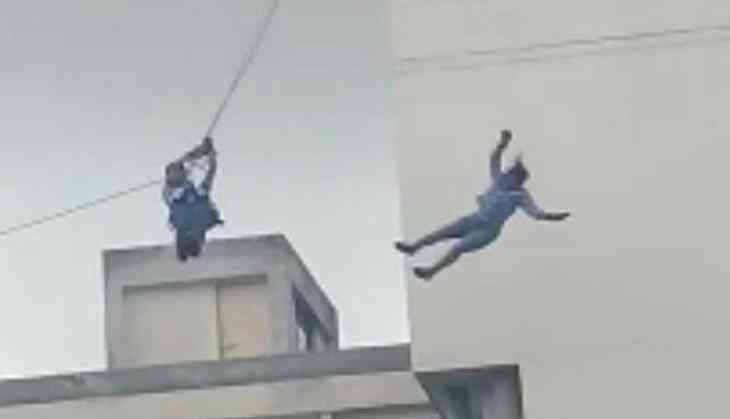 A demonstration session of adventure sports, rope climbing, claimed a young girl’s life in the Pink City on Monday. The cruel paradox of the freak accident was the fact that her own father, a qualified rope climber, was the trainer at the session and she herself was a training instructor. The demo session of the rope climbing was at a prestigious girls’ college in the Mansarover locality of the city. The 21-year-old second-year BCA student, Aditi Sanghvi, reportedly lost her balance and fell from the sixth floor of college the building. It was a six-day mountaineering training, scheduled to start from next Wednesday and today was the demo session by the well-known mountaineer, Sunil Sanghvi. Aditi, his daughter, joined her father and the other team members. After the fall she was rushed to the nearby hospital but she died on the way. Catch News team spoke to some of the college students who were witness to the tragic incident. "She was waiting for her turn, when this unfortunate incident happened. This sudden turn of events left us horror-stricken. Even before we could realize what was happening, she fell down and hit the ground,” a first year student of mass media in the college said. “However, we are not sure whether the wet and slippery floor because of the rains led to the fall,” she added. In a statement issued by the college authorities, it is mentioned that Aditi was a training instructor. They termed the tragedy “an unfortunate accident”. The father of the victim gave a statement later to the police to the effect that the fall of the girl was an accident. He also absolved the college of any responsibility in the shocking mishap. However, the incident has left everybody with lots of unanswered questions including the one as to why there was no safety net at the time of the practice.